Does anyone know how to increase the amount of time a Graf can travel horizontally or vertically without increasing it's speed? Also Grafs with blocktop=1 don't carry the player with them. You sorta just slide off. These look nice, but we can't really use these without a download link. Did you forget to add it? I could port custom graphics if you need me to. Not the best at spriting though. Besides, isn't most of it just the SMW Hud already? Hey, does anyone know why I'm getting this error? 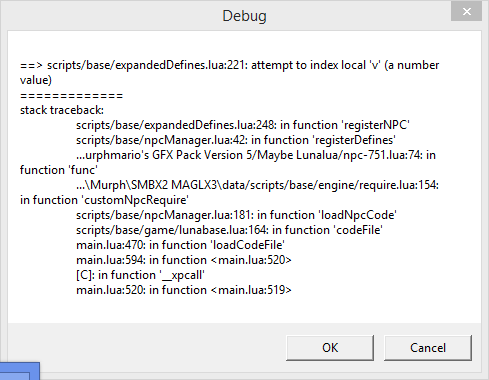 It's not an issue with Enjl's Parachute NPCs, so something must be wrong with my file. It is. NPCs just fall hrough them. They also fall through even if they're not on the snake block. Even after said snake block's gone, the NPCs still fall through the floor. Just a minor nitpick: The "Fluoresent" in the Tourian tileset isn't actually fluoresent, but something unique to the Metroid universe called a "Zebetite". That's pretty much all I have to say; the team all did a good job on this somewhat-update, and I hope future development goes nicely. Topic: something about super mario bros.
Re: something about super mario bros. It could just be that Mario's travelling through different time zones around the world. So it turns out that the issue with the download was on my end, not yours. Sorry about all that, litchh. Got it working now. The new download link doesn't really help; it's still giving me errors when I try to copy the files to my graphics folder. Edit: I have tried repairing the archive with both Winrar and Zip Repair. Neither of them worked. Hey, could you please upload this to a different site by any chance? The current download isn't working very well for me; either it outright fails or has some corrupted files in it. Wasn't the issues with releasing the source code discussed with Redigit himself one time? Honestly I feel like the cactus could be a bit better in terms of shading. Also, why not split up the custom-colored pipes like you did with the SMB3 colored ones? That way, people who use SMBX2 can actually use them. These graphics are pretty good asides from those issues, however.